B cells are lymphocytes which, along with T cells, constitute the adaptive immune system, providing a specifically targeted response to infection. For detailed information on B cell function, activation and lineage, refer to our B cell mini-review. 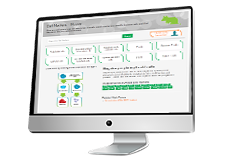 Selecting the right marker to identify B cell subtypes can be a time consuming process. In the tables below we have listed general key markers expressed by B cells and also markers that can be used to identify peripheral B cell subtypes. B cells are derived from the bone marrow (or bursa cells in birds), originating from hematopoietic stem cells, which differentiate into multipotent progenitor cells then into common lymphoid progenitor cells. The subsequent developmental process of B cells is complex with many different stages, which is dependent upon the stimuli received and through which the B cell gains its antigen specificity. At these stages of development different surface antigens are expressed enabling detection of specific B cells during their maturation process. Figure 1 below show the B cell lineage of both humans and mice alongside key markers for the different stages of development. For further information on B cell development, refer to our B cell mini-review. Figure 1: Human (a) and mouse (b) B cell lineage. 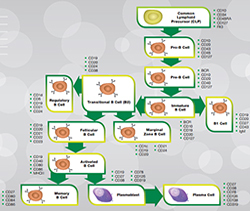 Click on the B cell lineage relevant image above to obtain human and mouse specific posters and guides. B cell activation begins by the recognition and binding of an antigen by the B cell receptor. This can either take place in a T cell dependent or T cell independent manner. Once the antigen has bound to the B cell, receptor mediated endocytosis takes place engulfing the antigen into the B cell, where the antigen is then degraded. These degraded antigen fragments are then presented on the surface of the B cell in complex with MHC class II molecules to T cells. T helper cells which have been activated by the same antigen recognize these antigen fragments and bind to the antigen-MHC class II complexes via their T cell receptor. This binding stimulates B cell proliferation and promotes differentiation into plasma cells, which switch from generating B cell receptors, which are membrane bound, to secreted ones called antibodies. Further stimulation of this process by T cells occurs via expression of CD40L which binds to CD40 expressed on the B cell and by the release of cytokines such as IL-4 and IL-21. In T cell independent activation of B cells, stimulation is by the binding of the pathogen to toll-like receptors and/or by the cross linking of B cell receptors to repeated epitopes on the pathogen. The T cell dependent activation of B cells is a longer process than T cell independent activation, taking several days, however higher affinity antibodies are produced providing a much more specific response to infection. 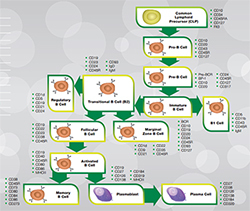 The differentiation of activated B cells is a two-step process. Firstly plasmablasts develop forming short lived plasma cells followed by the development of longer lived plasma cells and memory B cells for life long protection. The second stage of development takes place in germinal centres which form inside lymphoid follicles, facilitated by T follicular helper cells. Future infections by the same pathogen will activate the memory B cells, developed during the initial infection by the pathogen by the process described above. Here again the antigen is recognized, bound and internalized by receptor mediated endocytosis, which as before can be T cell dependent or independent. The fragmented pathogen antigens are presented to T cells in complex with MHC class II molecules. Following T cell receptors binding of this complex the memory B cells are stimulated into plasmablasts or plasma cells generating more plasma cells and memory B cells. This process of memory B cell activation is much quicker in generating a specific response to the infecting pathogen. For further information on B cell function and activation refer to our B cell mini-review. LeBien TW and Tedder TF (2008). B lymphocytes: how they develop and function. Blood 112, 1570-1580. Melchers F (2015). Checkpoints that control B cell development. J Clin Invest 125, 2203-2210. Naradikian MS et al. (2014). Understanding B cell biology. In Drugs targeting B-cells in autoimmune diseases, Milestones in drug therapy, X. Bosch et al., eds. (Springer Basel), pp. 11-35. Searching for your antibody of choice is made easy by the use of the sophisticated filter table, which allows you to select for specific antibody parameters. If you are unable to find your desired antibody simply contact us as we are adding new product all the time and we will be happy to help advise you.